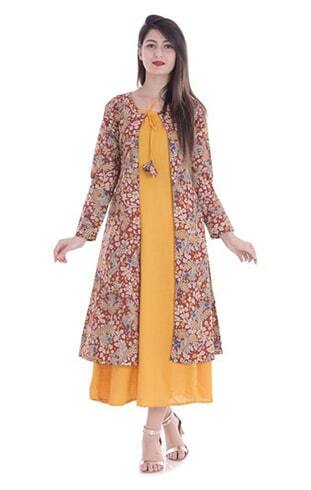 The kurti is an essential piece of ethnic wear. Simple to put on and comfortable to wear for long hours, it makes for a versatile clothing item. One of the popular designs of kurtis comes in the form of double layers. The highlight of the double layered kurtis is the additional fabric layer that comes in varying patterns. Most commonly, the printed top is worn as the outer layer over a top or plain kurta. 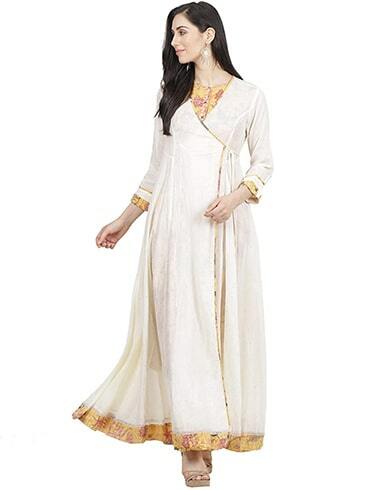 These types of kurtis are available in long slits, side slits, and high-low slits. They also feature prints like ethnic motifs, floral, embroidery, and patchwork. It can be easily worn to any occasion. The trendy asymmetrical kurta by Ritu Kumar features a notch neck and ¾ sleeves. It is ideal for all women and is a must-have in every staple. The attire as seen on Tapsee Pannu has a hint of tassels and embroidery. Featuring a red layered kurta with floral hand embroidery on the bodice and dotted edging towards the hemline. The sleeveless piece with multiple design slits is worn with matching red pants. Featuring a round necked kurta with three-quarter sleeves on the extended finish. 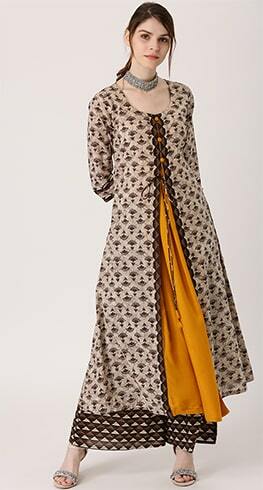 The beige, mustard yellow kurta with tie-up detail on the front is paired with black pants with ethnic motifs. The set features a grey kurta in organic cotton with embroidered flower motifs spread all over. It has an open front paired with grey flared tops. It also features black and tasseled openings. The set is paired with flared black pants. Featuring a green, white, and yellow printed layered kurta in layered style and floral pattern. It is paired with yellow and white flared pants. The set also features a tie-up detail, round neck, and straight cut long hem with no slits. The brown and grey cotton kurta features a round neck with three quarter sleeves. It also has ethnic motifs spread all over with a tie-up opening on the front. The kurta is completed with a set of blue pants. 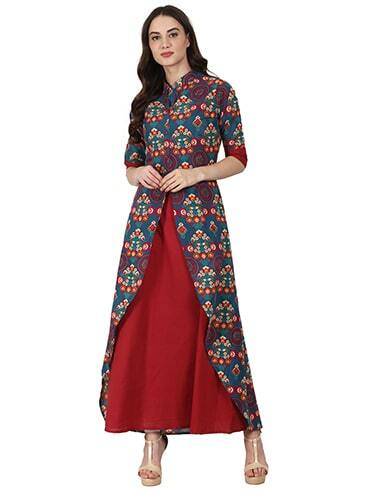 The double kurti features a red and teal blue print in cotton with ethnic embroidery. It also features a mandarin collar, short sleeves, flared hem, button detail, and front slit. Dress up in this gorgeous outer-printed red silk kurta, giving a double layered effect. 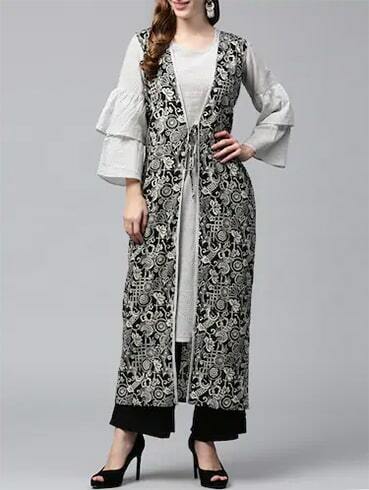 Its light embroidery with grey flared pants and ¾ sleeves makes this set a great addition in your wardrobe staple. Get ready to witness a splash of this fresh cut kurta featuring a gorgeous A-line suit in yellow. It has floral motifs spread all over, adding to its gorgeous design. This kurta with collared neck and ¾ sleeves is suitable for all special events. 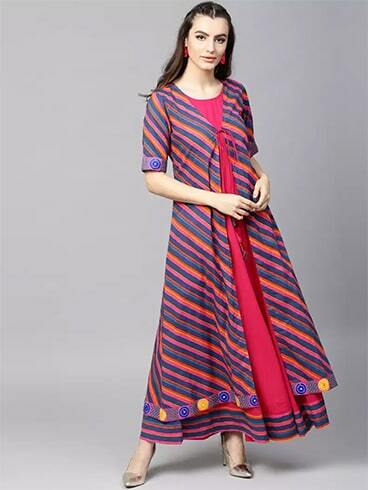 The striped, multi-colored kurta is perfect as a day-time look. If you are attending a festival event, draw drama to your wear with flared pants. Add multi-layered studs or chandbali earrings to finish the look. The Kalamkari printed kurta has peacock motifs all over it making it a unique piece. It also features A-line hemline and is sleeveless. The yellow cotton kurta has pockets on both sides. Hope you enjoyed going through our collections of double layered kurtis. Do leave us a feedback in the comment section below.